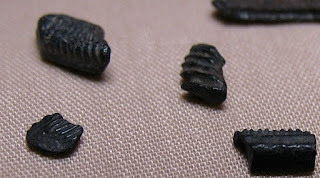 Eagle ray teeth fossils (Myliobatis sp.) found in the Peace River Formation of Florida. The fossils are from the Eocene Epoch of the Palaeogene Period. 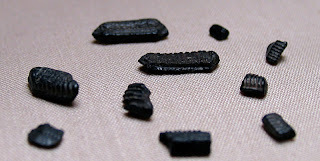 Thanks to Pam and Herb for the Peace River Formation gravel that these fossils were found in.